Village of Brown Deer ($50,000)With this $50,000 award, the Village of Brown Deer will remove the eight-foot-wide, concrete-lined channel of Beaver Creek that stretches between the Brown Deer Recreational Trail and N. Green Bay Road. 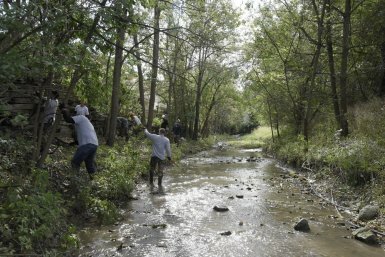 This restoration effort will reduce flooding, improve water quality, and provide both enhanced recreational opportunities as well as greater aesthetic appeal to this tributary of the Milwaukee River. River stone will replace the 33,000 square feet of concrete to not only control erosion, but also allow more infiltration and groundwater recharge. The Village also plans to construct meanders and riffles to slow river velocity and provide fish spawning areas.